Firstly, Creative Assembly have announced the next DLC for Total War: WARHAMMER II named The Prophet & The Warlock. It's going to release for Windows on April 17th, with Feral Interactive announcing today that the Linux (and Mac) release of this new DLC is going to be "shortly" after Windows. 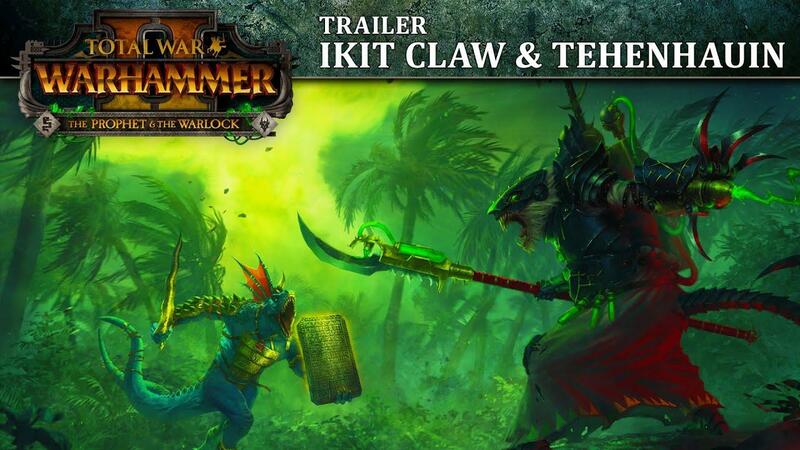 Two new Legendary Lords, Ikit Claw (Skaven) and Tehenhauin (Lizardmen), with their own quest-chains, legendary items and skill trees. Two new playable factions, Clan Skryre (Skaven) or the Cult of Sotek (Lizardmen), with unique new campaign mechanics. Nine new battlefield units and variants, including the bullet-spewing Ratling Gun Weapon Teams and the fearsome Ripperdactyls. New Regiments of Renown for players to unlock, recruit and field. Additionally, to go along with the Total War theme, Humble Store are doing their own Total War weekend sale. See them all here on the Humble Store. Please tell me...should I wait for Linux version of Rome II few more years or just grab the Windows version? sonic Please tell me...should I wait for Linux version of Rome II few more years or just grab the Windows version? I'd buy Attila instead, which runs native and according to most reviews and my experience (played the grand campaign as Frankish empire) has better game mechanics than Rome II - if you don't mind the later scenario. With Attila one ought also to keep an eye on the 'Ancient Empires' mod - which brings the classic Roman Age (with more historic details and factions than Rome II, and his hailed by some gaming articles as 'Rome II as the fans would have wished it to be') to Attila. It is presently in beta BUT does NOT YET run under Linux, since the download is via Steam Workshop only - and that one is not compatible with native Attila. However other, also larger mods downloadable from moddb for Attila, where several (Middle Ages, Game of Thrones, Tolkien, etc.) are in the making, and work just fine with the workaround for Attila mods under Linux. And should the 'Ancient Empires' mod become downloadable via moddb or any other common source it ought to be playable as well. PLUS after installing "ubuntu-restricted-extras" and "ubuntu-restricted-addons" (otherwise fonts appear distorted within the Workshop and the Mod Manager) on my system. Thus 'Ancient Empires' (part I and II files) + 2 submods launched rather flawlessly. In Attila/AE: Benchmark, custom battle and Grand Campaign start. There remains some a problem though, parts of units and landscape appear somewhat greyish. This may be video driver related, or I simply did not find the just setting yet. Thanks for replies. I am big fan of Total War and ancient Rome. I played hundreds of hours Rome: Total War on Windows, then via Wine. Some time ago I bought Linux version of Medieval II because of LOTR mod. Unfortunately mods for Linux version of Medieval worked only with some limitations. So here I am again, Total War with Rome, but without Linux support. Is not better to just play Rome II under Wine than playing Rome mod for Attla under Wine/Proton? sonic Thanks for replies. I am big fan of Total War and ancient Rome. I played hundreds of hours Rome: Total War on Windows, then via Wine. Some time ago I bought Linux version of Medieval II because of LOTR mod. Unfortunately mods for Linux version of Medieval worked only with some limitations. So here I am again, Total War with Rome, but without Linux support. Is not better to just play Rome II under Wine than playing Rome mod for Attla under Wine/Proton? Well, that's up to your personal choice - game mechanics (building trees, families, etc.) and 'historic accuracy' between Ancient Emp. and Rome II differ, there are endless discussions on the web. But having played the Grand Campaign in AE under wine on my system (see my specs) for two hours now I have to state that large battles (sieges with 3 to 4 armies) get rather laggy, even on lowest details. EDIT: Vanilla Attila under wine makes an average 13 fps in the benchmark, so there should be not much difference in performance between the Steam Windows version with and without mods through wine. EDIT: The lags seem to be memory related though, first two sieges I were fine, during the third things suddenly started to stutter, so taking breaks in between should prevent that under wine. ... or as you have played LOTR mods for Medieval II you just opt for TW Warhammer, which is also at a reasonable discount and has a Linux port - played two full campaigns myself a year ago (Dwarves and Empire) and enjoyed it a lot.